It can be hard to always come up with original meal ideas or not to slip off the Paleo wagon from time to time from lack of options or a pantry that still contains some not so good food choices. The best way to represent a typical paleo eating plan is to give out a sample of a week or two worth of food. Remember that you can skip a meal whenever you feel like it and the paleo diet is really not about eating three square meals per day, quite the contrary. If you decide to fast for a day, that’s perfectly fine as well, but I’ve included three meals and a snack every day just to give you enough options to play around with it. Where applicable, I’ve included a link for the recipe as well. To be perfectly honest, a meal plan like that can easily be stretched to four or even five weeks, because there will be leftovers to about every dinner as well as some of the lunches that you can use whenever you want during the rest of the week or freeze for a later time. This will also save you from having to prepare food for every single meal. Some of the meals require quite a bit of preparation time, but most can be prepared a day in advance to make it easier. Some, like soups, stews and roasts, take time to cook, but not much active preparation time. We recently released a new offer coupled with the cookbook called the Paleo Weekly Planner . We’ve basically taken on the task of planning all your Paleo meals out for you. With the weekly planner, you’ll receive a 7-day meal plan every week in your email inbox. It’s definitely a good way to make your life even easier. 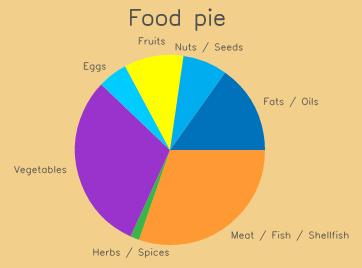 For general day to day meal construction, here is a pie chart representing ratios (by volume of food) you should strive for. Of course, this can be tweaked to your particular needs and preferences, but it can give you an idea of where you stand, especially if you don’t feel as good as in the beginning and wonder why. Often it’s just a matter of a food group like nuts and seeds or fruits slowly creeping up and replacing healthier meat, fish or vegetable choices. There is about as many ways to eat a paleo diet that there is people though so feel free to more or less of everything, especially if you’re experienced enough to know your needs and to listen to your body.